Here is the list of the hotels near Guyancourt. Book your hotel near Guyancourt today, Thursday 09 May for the best price, reservation and cancellation free of charge thanks to our partner Booking.com, leader in on-line hotels reservation. Below here is the list the 50 closest hotels of Guyancourt, sortable according your criteria. You will find the position of these accommodations on the Guyancourt hotels map. Guest accommodation Guyancourt Preferred hotel ! Residhome Paris-Guyancourt is located to the heart of St-Quentin-en-Yvelines's business centre. Its furnished apartments have a work area, kitchen, eating area and flat-screen TV. All of the apartments are serviced by a lift and have free Wi-Fi internet access. Laundry and cleaning services and the daily continental breakfast are available at an additional cost. The Residhome Paris-Guyancourt is open 24 hours a day. It is in the village of Guyancourt, just 7 km from the Chateau de Versailles and 3.5 km from Le Golf National. Located between the Chevreuse Valley and the city of Paris, near the Château de Versailles, Hôtel Best Western The Wish Versailles offers a terrace and a heated, outdoor swimming pool. Golf National is 3 km away from the hotel. Hôtel Best Western The Wish Versailles features contemporary guestrooms which are stylishly decorated and furnished. They are all equipped with flat-screen TV with Canal Satellite, free Wi-Fi internet access and modern en suite facilities. Whether its a business lunch or an evening meal with friends, our large, bright and recently redesigned restaurant serves up simple and contemporary cuisine offering a choice of starters at the buffet and a selection of desserts. The hotel is close to the main techno-pole of the area making it a great choice for business travellers. Leisure travellers will also find it practical for visiting the areas sights and its proximity to the city of light. Featuring free WiFi throughout the property, ibis Styles Guyancourt Versailles offers pet-friendly accommodation in Guyancourt, 22 km from Paris. Guests can enjoy the on-site restaurant. Private parking is available on site. Golf National is 1.7 km away from the hotel. Serviced by a lift, every room at this hotel is air-conditioned and is equipped with a flat-screen TV. The rooms include a private bathroom with a hairdryer and free toiletries. You will find a 24-hour front desk at the property. The centre of Versailles is 7 km from ibis Styles Guyancourt Versailles, while Villepinte is 59 km from the property. The nearest airport is Paris - Orly Airport, 29 km from ibis Styles Guyancourt Versailles. Campanile Voisins-le-Bretonneux is a pet-friendly hotel, only 20 km from Paris. Free WiFi is available throughout and free private parking is available. Golf National is a 6-minute drive away from the hotel. Each of the air-conditioned rooms at the Campanile Voisins-Le-Bretonneux comes with a direct-dial phone and coffee/tea maker. In-room entertainment facilities include satellite TV. Guests enjoy free TV Internet access. Housekeeping services are also offered. Guests can enjoy a drink at the bar and have a meal at the on site restaurant. Campanile is approximately 5 km from the 'Parc Naturel Régional de la Haute Vallée de Chevreuse' (Natural reserve of the High Valley of Chevreuse). This Novotel sits overlooking the prestigious Le Golf National where the Open de France is played each year. Just a few kilometres from the Chateau de Versailles and the Chevreuse Vallee, the Novotel Saint Quentin Golf National offers air-conditioned rooms equipped with private bathrooms, satellite TV and Wi-Fi internet access. The hotel restaurant, Novotel Café, serves traditional meals made with organic products and dishes prepared with a griddle. It also provides a terrace with views of the pool and the golf course. There is also a clubhouse with a bar where golfers can enjoy a variety of drinks, cocktails, tasty food and snacks.. There are also 2 tennis courts, 13 function rooms an amphitheatre that can accommodate up to 250 people and a free private car park on site. Up to 2 children (15 years and under) stay free when sharing with parents. Located in Voisins-le-Bretonneux, Le Relais de Voisins has a garden, terrace and bar. This 3-star hotel offers a 24-hour front desk. Guests can enjoy garden views. At the hotel, all rooms have a desk. The rooms are equipped with air conditioning, a wardrobe and a flat-screen TV, and some units at Le Relais de Voisins have a balcony. At the accommodation, each room has a private bathroom with free toiletries. A buffet breakfast is available every morning at the property. Guests can dine in the on-site restaurant, which serves French cuisine. Paris is 34 km from Le Relais de Voisins, while Versailles is 11 km away. Paris - Orly Airport is 31 km from the property. This hotel is situated 30 km from the west of Paris and is easily accessible via the A13 / A12 motorways. Hotel Mercure Saint Quentin En Yvelines Centre is just 50 m from the train station (RER C) and located in the new town of St Quentin en Yvelines and near major companies offices. There is a restaurant (French cuisine) and a bar. Meeting facilities are also available. This Campanile hotel is located in Saint-Quentin-en-Yvelines, just 25 km from the Paris border and 10 km from Versailles. It offers air-conditioned rooms just a 15-minute walk away from Roussières Lake and Forest. The modern guest rooms are equipped with a TV, telephone and free Wi-Fi access. Every room features a private bathroom with a hairdryer. Guests can enjoy Canal+ and beIN SPORTS channels, both in the room and in the hotel lounge. Campanile Saint-Quentin-en-Yvelines features both a bar and a restaurant, which is open every day. Breakfast is served every morning. The hotel is located 400 metres from the RER Train Station providing access to Paris city centre. Orly Airport is 20 km away. Le Golf National is 5 km away from the hotel. Located just 3 km from the famous Château de Versailles, ibis budget Versailles Chateau features a terrace and 24-hour reception. Free WiFi access is provided as well as daily newspapers. Le Golf National is 6 km away. All rooms feature a flat-screen TV with satellite channels, a desk and heating. The en suite bathroom includes free toiletries. A breakfast is available each morning at ibis Budget Versailles Chateau. Guests can also find restaurants in the town centre. Saint-Quentin Pond is 6 km away and Versailles town centre is only an 8-minute drive from the hotel. Saint-Cyr RER station is 800 metres away and offers direct access to the centre of Paris. This Premiere Classe hotel is located 5 kilometres from the Château de Versailles and 10 km from the French miniature village. It offers affordable accommodation and en suite guest rooms with free Wi-Fi access and air conditioning. The Premiere Classe Versailles offers free parking is easily accessible by the A12 and the A86 motorways. A buffet-style breakfast is served every morning and the Premiere Classe Versailles is also close to local restaurants and supermarkets. Saint-Cyr RER station is a 10 minute walk from the hotel and offers direct access to central Paris. Orly Airport and Thoiry Zoo are just a 30 minute drive away. Located 4.9 km from the Palace of Versailles, this hotel offers air-conditioned rooms with free Wi-Fi. A restaurant and bar are available on site and the hotel is 1.5 km from the A12 motorway. Guest rooms at the Kyriad Versailles - St Cyr l'Ecole are modern and each equipped with a flat-screen TV with satellite channels. The en suite bathrooms offer a hairdryer and a bathtub or shower. Interconnecting rooms are available upon request. A buffet breakfast can be enjoyed each morning in the dining room or in guests’ rooms. The hotel’s restaurant serves seasonal dishes and the bar is open 24 hours a day. Services offered at this hotel include free newspapers and magazines in the lobby and free private parking. The entire hotel is serviced by a lift. The hotel is situated 1.3 km from St-Cyr RER Train Station and 5 km from Saint-Quentin Golf Club. A public swimming pool is located 500 metres from the hotel. Le Golf National is a 12-minute drive away. Situated in Saint-Cyr-lʼÉcole, Creativ Appart provides accommodation with a kitchen. Free WiFi is provided. Each unit has a dishwasher, oven, a coffee machine, as well as a microwave and kettle. There is a fully equipped private bathroom with shower and free toiletries. Paris is 29 km from the apartment, while Versailles is 6 km away. Paris - Orly Airport is 28 km from the property. Located in the Haute Vallée de Chevreuses Regional Natural Park, 13 km from Versailles and 28 km from Paris, Cottage Maison Prairie Bonheur is a 3-bedroom cottage with a garden and a terrace. The cottage features a seating area, a washing machine, ironing facilities, and the private bathroom is complete with a hairdryer. The fully-equipped kitchen includes BBQ facilities, an oven, refrigerator and microwave. A toaster and electric kettle are also provided. A continental breakfast is available daily with a supplement and you can also enjoy homemade meals prepared by the hosts with fresh products from the garden. This service is available upon request. 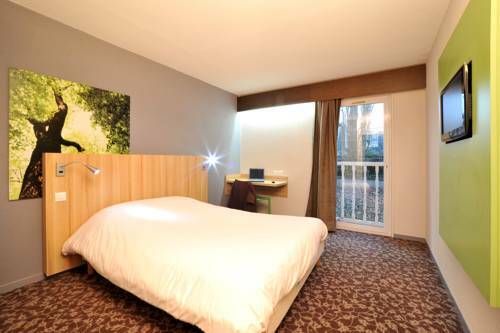 Ibis budget Saint Quentin Yvelines - Vélodrome is situated in Montigny-le-Bretonneux, 2.3 km from Saint-Quentin-en-Yvelines. Free WiFi is provided throughout the property. A paid parking is available on site. All rooms have a flat-screen TV. The rooms are fitted with a private bathroom. There is a 24-hour front desk at the property. The nearest airport is Paris - Orly Airport, 25 km from the property. Le Golf National is 6 km away from the hotel. Bed and Breakfast Magny-les-Hameaux Preferred hotel ! Located in the Nature Park of the Haute Vallée de Chevreuse, this B&B offers rooms with free Wi-Fi and a garden with a heated spa bath, available with an extra cost. Bikes can be rented on site. Provided with touristic guides of the region, each room at Maison Prairie Bonheur has a private entrance, a TV with DVD player and a private bathroom. All of the room have private parking on site. A continental breakfast is served every morning and it can also be taken on the furnished terrace during warmer months. For lunch and dinner, homemade food can be made upon request. Paris is 25 km away while the Château de Versailles is 7 km away. Maison Prairie Bonheur is accessible via the A12 Motorway, which is 7.5 km away. L'EDEN WEISS is located in Magny-les-Hameaux. Free WiFi access is available in this holiday home. The accommodation will provide you with a terrace and a seating area. There is a full a kitchenette with a microwave and an oven. Featuring a shower, private bathrooms also come with a hairdryer and free toiletries. At L'EDEN WEISS you will find a garden and a terrace. The property offers free parking. If you feel like visiting the surroundings, check out Paris National Golf Course (2.2 km) and Saint-Rémy-lès-Chevreuse (5 km). This holiday home is 47 km from Paris - Charles de Gaulle Airport. Set in Montigny-le-Bretonneux, ibis Saint Quentin en Yvelines - Vélodrome features a terrace. This 3-star hotel offers a 24-hour front desk. The hotel features a shared lounge. At the hotel, rooms have a desk. 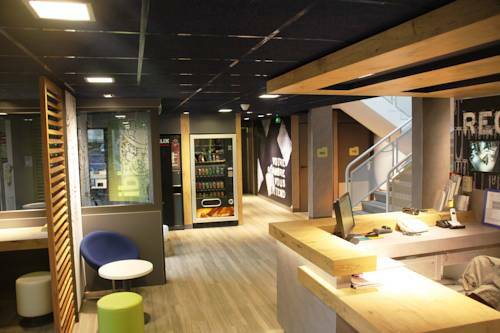 Featuring a private bathroom, rooms at Ibis Saint Quentin en Yvelines also boast free WiFi. All units in the accommodation are fitted with a flat-screen TV and a hair dryer. A buffet breakfast composed of sweet and savoury dishes such as eggs, fruit salad, yogurts and juices is served every day. Pastries baked on site and fresh French Madeleine cakes are also on offer, as well as a hot beverage and a piece of fruit to take away. Outside of regular breakfast hours guests can also enjoy a lighter option, available from 04:00. Saint-Quentin-en-Yvelines is 2.3 km from ibis Saint Quentin en Yvelines - Vélodrome. The nearest airport is Paris - Orly Airport, 25 km from the hotel. Hotel Buc Preferred hotel ! Best Western The Hotel Versailles is located in Yvelines between Versailles and the Saint-Quentin business district. The guest rooms offer free Wi-Fi access and a Nespresso coffee machine. Rooms are functional with a modern design and have flat-screen TV, a telephone with alarm clock and private bathroom. The Hotel Versailles Restaurant has a terrace and offers traditional meals made with fresh and seasonal products. Guests can book and print tickets for events at the hotel's reception. Best Western The Hotel Versailles is just 20 minutes from the theme park, France Miniature, and just a 13-minute drive from the Palace of Versailles. Le Golf National is a 10-minute drive away. The city centre of Paris and the Louvre museum can be reached in 40 minutes. Hotel Montigny-le-Bretonneux Preferred hotel ! Offering a restaurant, Kyriad Saint Quentin en Yvelines - Montigny is located in Montigny-le-Bretonneux, a 30-minute drive from Paris city centre and 12 km from Versailles. Free Wi-Fi access is available. Rooms here will provide you with a flat-screen TV, air conditioning and a minibar. The bathroom comes with a shower, a hairdryer and free toiletries. Some of them are designed for guests with reduced mobility. Guests can enjoy a buffet breakfast every morning and a la carte menus are proposed at the hotel’s restaurant. At Kyriad Saint Quentin en Yvelines - Montigny you will find a bar. Other facilities offered include luggage storage. With free parking, the hotel is 700 m from Saint-Quentin-en-Yvelines. Charles De Gaulle Airport is 46 km away. Golf National is 6 km away from the hotel. Hotel Saint-Cyr-lʼÉcole Preferred hotel ! Aerotel - L'étape du Silence offers rooms with free Wi-Fi and flat-screen TVs with satellite channels. It is located just a 5-minute drive from the Château de Versailles. Le Golf National is a 16-minute drive away. The hotel has a flower-filled garden. Guests of the Aerotel can enjoy a daily country-style buffet breakfast. For guests coming by car, the hotel is easily accessible from the A12, N12 and A86 motorways. Free parking is provided on site. The Aerotel – L’etape du silence is a 30-minute drive from central Paris and is located 4 km from Golf Saint-Quentin-en-Yvelines. The property is 850 metres form Saint-Cyr Train Station, providing direct access to the Eiffel Tower within 40 minutes. There is a bus stops at a 2-minute's walking distance from the hotel, offering access to Versailles Castle. Bike rental is also available at the hotel and the A13 motorway is 7 km away. Located in Montigny-Le-Bretonneux, this hotel offers rooms with free Wi-Fi internet access and a restaurant with a terrace. The Palace of Versailles is 12.2 km away and National Golf Course is 4.5 km from the hotel. Guest rooms are elegantly decorated and offer guests a flat-screen TV and safety deposit box, as well as tea and coffee making facilities. They each have a modern en suite bathroom equipped with bathrobes and a bathtub or shower. Breakfast is served each morning at the hotel and can be enjoyed in the comfort of guests’ rooms. In the evening guests can enjoy a drink in the bar, which features a 14th century fireplace, or sample Provençal cuisine in the restaurant. Located 6 km from Versailles, a city with an amazing historical and cultural heritage, the Campanile Versailles Buc offers cosy accommodation with free WiFi. Rooms at the Campanile Versailles Buc are equipped with a wardrobe. Each room feature modern en-suite facilities. You can engage in various activities such as golfing in the area. The property has established a partnership with Saint-Quentin-en-Yvelines Velodrome Stadium, 9 km from the property. At once within easy reach of Paris and away from the lively capital, Versailles has a modern atmosphere while retaining its original period charm. Set just 5 km from Versailles and its famous Château, in the heart of Buc, the Buc Lounge Hotel will spoil all guests with a warm and peaceful setting. Its 24 guest rooms offer a quiet and relaxing atmosphere. Each room comes with LCD television and Wi-Fi Internet access. The Buc Lounge Hotel allows you to fully discover Buc, its castle and park, as well as the beautiful Château de Versailles. Located in Buc, just 20 km from Paris, Les Clefs du Roy offers modern accommodation with free WiFi access throughout. The property has a 24-hour reception and luggage storage. Each accommodation is air-conditioned and features a desk, wardrobe and flat-screen TV with satellite channels. The private bathroom has a shower and the kitchenette is equipped with a stovetop, refrigerator and microwave. A breakfast is available each morning at Les Clefs du Roy and can be served in the comfort of your suite. Grocery shops and restaurants can be reached within 2 km of the property. Additional features include a garden, facilities for disabled guests and free private parking on site. Buc Grand Versailles Golf Course is opposite the hotel and the Palace of Versailles is a 15-minute drive away. Le Golf National is a 12-minute drive away. 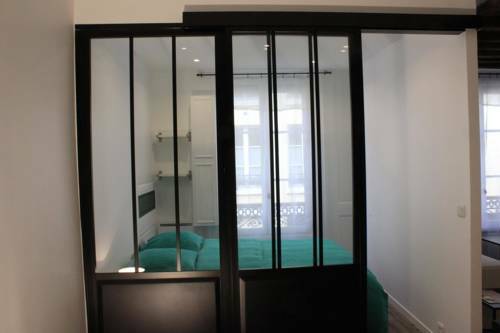 Appart'City Versailles Saint Cyr l'Ecole is 2 km from Saint-Cyr RER Train Station, which offers direct links to the centre of Paris. You can use the internet access in your accommodation, and the Chateau de Versailles is 5.8 km away. Golf National is 7.4 km away. The apartments and studios at Appart'City Versailles Saint Cyr l'Ecole are decorated in a contemporary style and have an LCD TV. Each one also has a work desk and a private bathroom, complete with a hairdryer. You will be able to use the kitchenette’s hot-plates and microwave to prepare homemade meals. Dishes can then be enjoyed in the small dining area. A buffet breakfast is available. Breakfast is composed of various breads, including gluten-free bread, pastries, fresh and hot beverages. Fresh fruit and fruit salad, as well as cheeses and yogurts are also provided. Additional facilities at this residence include a laundry service and a lift. Private parking is also available on site and with an extra cost. Located in the Île-de-France region, this property is 2 km from Saint-Cyr RER Station, which leads directly to the centre of Paris. It offers apartments and studios with a kitchenette. Provided with free WiFi, each accommodation type at L'Aéronat by Popinns offers a desk, a wardrobe and a private bathroom with a shower. Towels, and linen, dishes and kitchenware are included in the room rate. Guests can prepare their own meals in the kitchenette, which features a microwave and a refrigerator. Restaurants can be found within 600 metres of L'Aéronat by Popinns. The property is 1.5 km from Fontenay-le-Fleury Train Station and 7 km from Château de Versailles. Golf National is 7.5 km away. Private parking is available on site at an additional cost. Set in the Vallée de Chevreuse Regional Nature Park, Gîtes Le Petit Nailly offers self-catering accommodation, breakfast at a supplement and free Wi-Fi in the apartments. The apartments feature a living room with a flat-screen TV and a DVD player, and a terrace. The private bathroom includes shower and there is a separate toilet. The fully-equipped kitchen has a dining area, oven, stove, refrigerator and microwave. An electric kettle is also provided, and BBQ facilities are available upon request. Bikes, table tennis, darts, garden furniture and board games are at guests’ disposal, and meals can be taken in the living room or delivered to the apartments upon request. Saint-Rémy-les-Chevreuses Train and RER Station is 5 km away. Chambres d’Hôtes Le Petit Nailly is 1 km from the centre of Mangny-les-Hameaux and 14 km from the Château de Versailles. It offers free Wi-Fi, a flowered garden with sunbeds and free bike rental. All rooms at Chambres d’Hôtes Le Petit Nailly include a flat-screen TV, a DVD player and a desk. The private bathroom is complete with free toiletries, a hairdryer and a shower. Breakfast can be enjoyed every morning on the terrace. Meal trays can also be served if you reserve 24 hours in advance. Guests can play table tennis and darts at the property. Chambres d’Hôtes Le Petit Nailly is 46 km from the centre of Paris and 25 km from the Château de Rambouillet. Free private parking is available on site. Chambre d’Hôtes Quietude is located 13 km from the Château de Versailles, in the Haute Vallée de Chevreuse Natural Regional Park. It features a garden with a furnished terrace and free Wi-Fi access is provided. The rooms are individually decorated and have views of the garden. Each room includes a TV, an electric kettle, a microwave and a small fridge. The private bathroom has a shower and free toiletries. A continental breakfast is served daily. There are 2 bicycles available free of charge, and there are a number of cycling routes in the area. Chambre d’Hôtes Quietude is a 40-minute drive from the centre of Paris. Set in Magny-les-Hameaux in the Ile de France region, Chambre d'Hôtes Jean Racine has a terrace and garden views. The bed and breakfast is in an area where guests can engage in activities such as cycling and fishing. The bed and breakfast is equipped with a flat-screen TV. A continental or American breakfast can be enjoyed at the property. Guests at the bed and breakfast can enjoy hiking nearby, or make the most of the garden. Paris is 36 km from Chambre d'Hôtes Jean Racine. The nearest airport is Paris - Orly Airport, 34 km from the property. Guest accommodation Magny-les-Hameaux Preferred hotel ! Located in Magny-Les-Hameaux, this hotel is 3.5 km from St-Rémy Lès Chevreuses Train Station, giving direct access to Paris. Versailles is 14 km away and Rambouillet is 25 km from the hotel. The property offers apartments and studios with fully equipped kitchenette. Free WiFi access is available. Each apartment and studio at the Zenitude Hôtel & Résidence - Magny-Les-Hameaux has a seating area with a sofa and a flat-screen TV, and a private bathroom with luxury products. All apartments and studios are accessible by a lift. The buffet breakfast is served in the breakfast room, except on Sundays and public holidays. Laundry facilities and private parking are provided. Zenitude Hôtel & Résidence - Magny-Les-Hameaux is surrounded by Parc Naturel régional de la Haute Vallée de Chevreuse. Golf National is a 15-minute drive from the property. Located in Magny-les-Hameaux, Le Chant Des Oiseaux features barbecue facilities and a garden. Boasting a shared kitchen, this property also provides guests with a children's playground. The property provides garden views, a terrace, and free WiFi is available. All units in the guest house are fitted with a flat-screen TV. The rooms include a private bathroom with a bath or shower and free toiletries. All guest rooms feature a wardrobe. A variety of popular activities are available in the area around the property, including cycling and hiking. Paris is 36 km from Le Chant Des Oiseaux, while Versailles is 13 km from the property. Paris - Orly Airport is 33 km away. Located in the Versailles Historic District, 200 metres from the castle, Villa de la Pièce d'Eau des Suisses is a family-run B&B and offers a view of the landmarks. Guests can relax on the garden or read a book. Free WiFi is provided. With views of the lake and the garden, the room at Villa de la Pièce d'Eau des Suisses has parquet flooring. The private bathroom is set on the landing and includes a shower, hairdryer and free toiletries. The continental breakfast can be served in the garden and includes fruit juice and fresh bread. Restaurants and bars can be found within a walking distance. The B&B is situated 250 metres from the train to the capital and 1 km from the local market. The A86 motorway is 4 km away. This family-run hotel is situated in the historic Saint Louis district of Versailles. It offers guest rooms with free Wi-Fi internet access and a flat-screen TV. Hôtel Le Home Saint Louis boasts easy access to Versailles Chantiers RER station, where you can catch frequent trains to Paris. The famous Chateau de Versailles is a 14-minute walk from the hotel. The staff at the Hôtel Le Home Saint Louis will be happy to help you organise your stay in Versailles 24 hours a day. Les Carrés is a self-catering apartment located in Versailles, set in a building dating from 1775, featuring a small private terrace and free Wi-Fi access. The Chateau de Versailles is a 15-minute walk away. The apartment has a dining area, a lounge area with a TV and a separate, equipped kitchen, complete with an espresso machine and a dishwasher. There is 1 bedroom and a bathroom with a bathtub. You will find a large choice of shops, restaurants and cafés within a 5-minute walk of the apartment. Versailles – Château Train Station is 400 metres away and provides direct access to central Paris. Located in Versailles in the Ile de France region, LE RELAIS D'ANJOU features accommodation with free WiFi. Some units also have a kitchenette equipped with a dishwasher, a microwave, and a toaster. Popular points of interest near the apartment include Palace of Versailles, ENSP Versailles and Versailles Town Hall. The nearest airport is Paris - Orly Airport, 24 km from Le Relai D'Anjou. Hotel Versailles Preferred hotel ! Logis La Residence Du Berry is situated in the heart of the Saint Louis district, close to the world famous Chateau de Versailles and its gardens. Located 200 metres Versailles Rive Gauche Train Station, it has a vaulted 18th-century wine cellar where private vintage wines mature year after year. Accessible by a lift, each en suite guestroom is fitted with a flat-screen TV with cable and satellite channels. Free Wi-Fi internet access is available. Ironing facilities can be requested at the reception. Guests can enjoy a game of billiards, have a drink at the bar or use the internet. Breakfast is served daily in the dining room and restaurants can be found within walking distance. Logis La Residence Du Berry is conveniently located 500 metres from the Palais des Congrés and 800 metres from Versailles Chantiers SNCF Station. Le Golf National is a 12-minute drive away. Situated in Versailles with Palace of Versailles and Congress Center of Versailles nearby, Un jour Versailles... Features accommodation with free WiFi. There is also a kitchen in some of the units equipped with a dishwasher and oven. Gardens of Versailles is 3.4 km from the apartment, while Montbauron Stadium is 2.7 km from the property. Paris - Orly Airport is 25 km away. Hotel d’Angleterre is located opposite the Chateau de Versailles and 500 metres from the Versailles-Rive Gauche RER station. It offers en-suite accommodation with satellite TV and en-suite facilities. Guests are invited to relax in the Angleterre’s bar and garden. The hotel’s multilingual staff are available everyday at the 24-hour reception, which also provides free Wi-Fi access. From the RER station, guests of the Angleterre Hotel have easy and direct access to the Eiffel Tower and central Paris. Set 750 metres from Palace of Versailles and 2.9 km from Gardens of Versailles, La Ritournelle offers accommodation in Versailles. The apartment is 1 km from Montbauron Stadium. Free WiFi is featured throughout the property. There is a seating area and a kitchenette. Towels and bed linen are offered at La Ritournelle. Montreuil Domain is 1.6 km from La Ritournelle, while The Grand Trianon is 2.5 km from the property. Paris - Orly Airport is 19 km away. The Royal Hotel is located a 9-minute walk from the Château de Versailles in the Saint-Louis district and 250 metres from Gare de Versailles Château Rive Gauche RER Station, which provides direct access to the Eiffel Tower in Paris. Serviced by a lift, all of the rooms and studios at the Royal Hotel include free WiFi internet access, and a flat-screen TV. The bathroom is fitted with a bathtub or a shower. A buffet breakfast is served every morning at the property. The studio includes a kitchenette with a stove, kitchenware and a fridge. The staff at the Royal Hotel will be happy to help you organise your stay in Versailles and offers service 24 hours a day. They have welcomed guests in this property for 35 years. Versailles Convention Centre is 650 metres from the property. Golf National Golf Course is 8 km away. Hôtel du Jeu de Paume is located in the centre of Versailles, 500 metres from Château de Versailles. The hotel offers uniquely-decorated rooms and free WiFi access is available throughout. You can enjoy a view of the city from the room. Each room at Hôtel du Jeu de Paume will provide you with a flat-screen TV and cable channels. Featuring a shower, the bathroom also comes with a hairdryer and free toiletries. Tea/coffee facilities are provided in each accommodation and a daily continental breakfast is served in a yurt, located in the hotel. Breakfast is free for children under 10 years old. Lively streets with restaurants and bars are located within walking distance. The hotel is a 5-minute walk from Versailles-Château-Rive Gauche Train Station which provides direct access to the capital. Featuring free WiFi throughout the property, Appartement satory is an apartment located in Versailles, 600 metres from Palace of Versailles. The apartment is 2.5 km from Gardens of Versailles. There is a seating area and a kitchen complete with a microwave, a toaster and a fridge. Towels and bed linen are featured in this apartment. Montbauron Stadium is 1.1 km from Appartement satory, while Montreuil Domain is 1.8 km away. The nearest airport is Paris - Orly Airport, 19 km from Appartement satory. Apartment Versailles Preferred hotel ! La Cour des Chevau-Legers is a self-catering accommodation located in Versailles, just 600 metres from the Palace of Versailles. Free WiFi access is available throughout. The 1-bedroom apartment features a seating area with flat-screen TV and a sofa bed in the living room. It includes a private bathroom with shower. You can prepare meals using the apartment’s kitchen, which is equipped with an oven, hotplates and a microwave. There is also a dining table available for your convenience. Shops and restaurants can be found within walking distance from the accommodation. Versailles- Château RER Station (Line C) is 300 metres away and gives you direct access to Paris. Enzo Hôtels - Trappes is located a 5-minute drive from the city centre and the AFC Templiers Stadium, and a 1-hour drive from Paris. Its low-cost accommodation is perfect for a stopover or short stay. All of the rooms at the Enzo Hôtels - Trappes have a flat-screen TV and free Wi-Fi internet access. Each has a private bathroom that is fitted with a shower. Breakfast is served daily in the hotel’s dining area. Meals are served in the restaurant for lunch and dinner from Monday to Friday. Enzo Hôtels - Trappes also has an outdoor terrace that can accommodate up to 30 people. Free private parking is available on site. Complete with a garden, Atout Charme is situated in Versailles, 1.9 km from Palace of Versailles and 3.6 km from Gardens of Versailles. Guests may enjoy the free WiFi. The air-conditioned apartment consists of 3 separate bedrooms, 1 bathroom with free toiletries, a seating area area, and a living room. The accommodation is fitted with a kitchen with a dishwasher and oven. When guests need guidance on where to visit, the reception will be happy to provide advice. The apartment offers a terrace. Hiking can be enjoyed nearby. Montreuil Domain is 1.9 km from Atout Charme, while Montbauron Stadium is 2.7 km from the property. The nearest airport is Paris - Orly Airport, 23 km from the property. Offering city views, Close to the Palace Quartier St Louis is a self-catering accommodation located in Versailles. The property is only 850 metres from Chateau de Versailles and a 2-minute walk from Versailles RER station. Decorated with a modern style, the apartment offers a living room with sofa bed and a mezzanine bedroom. Featuring a shower, the bathroom also comes with a hairdryer and free toiletries. In the kitchen you will find a microwave, a dishwasher and a coffee machine. Many restaurants and shops are available within walking distance. Lambinet Museum is 1.2 km from the accommodation and Versailles Congress Centre is just 400 metres away. Charles de Gaulle Airport is a 45-minute drive from the property. Located in Versailles, Les Demoiselles à Versailles is a two-bedroom apartment boasting views of the Chateau de Versailles and the Royal Opera of Versailles. Housed in a 18th century building, this apartment features moldings and hardwood floor. It comes with an living area and an open kitchen. It offers views of the Château de Versailles. The owner may organize wine tasting and cooking classes. Private guided tours of the Château de Versailles can also be arranged upon prior request and at a surcharge. Guests can gets tickets for the Château de Versailles at a reduced rate. The Royal Chapel is 50 metres from Les Demoiselles à Versailles and gives direct access to the castle, while The Grand Trianon is 1.7 km from the property. The nearest airport is Paris - Orly Airport, 20 km from Les Demoiselles à Versailles. Below here is the hotels map of Guyancourt. Names and details of Guyancourt hotels can be shown on the map clicking on the prices icons.